Our Cookie Club first featured this recipe back in 2003. These easy to make homemade cookies taste just like our favorite Girl Scout® cookies; Thin Mints®. They have been our favorite ever since we were in the scouts, oh about 4 decades ago. 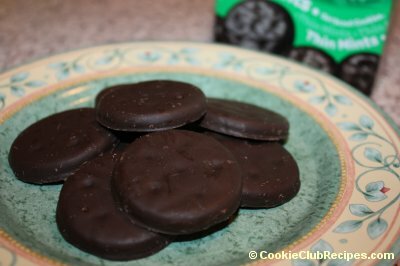 This recipe will make several dozen "Thin Mint" cookies. We've never used a whole box of crackers, or an entire package of almond bark, probably more like half of each. Oh my goodness, my mouth is watering just thinking about these delicious cookies! Melt about 6 ounces of almond bark at a time in the microwave, add 12 drops of peppermint to melted chocolate. Quickly dip crackers into chocolate, thoroughly covering both sides, then place on waxed paper to cool. Hint: We use a toothpick to help move the crackers in and out of the chocolate. We usually use several toothpicks for a batch of cookies and make a good mess of everything. But is is SO WORTH IT! Move cooled cookies to a container and continue the process until you have the amount of cookies desired.